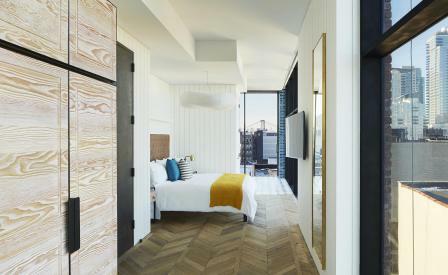 Williamsburg has been a hot bed for new hotels of late, but none have been quite so highly anticipated than The Williamsburg Hotel. Located on Wythe Avenue, a stone’s throw from the East River, the newly built property promises to be a gathering point for the neighbourhood’s hipster and increasingly affluent crowd with a restaurant, rooftop pool, three separate bars and the first grand ballroom in the area. Designed by Michaelis Boyd Associates, the hotel’s brick, Corten steel and glass structure is a bold, beautiful vision. Filled with natural finishes and double height ceilings, it is an enticing mix of contemporary elegance and nods to the neighbourhood’s industrial past. One of its bars (opening later in the year) is even installed in an ex-wooden water tower factory. Upstairs, each of its rooms boasts bespoke furniture designed by Michaelis Boyd and made in collaboration with Bill Amber Studio. Floor to ceiling windows showcase waterfront views that can be further enjoyed on the private balconies that accompany most of the rooms. Downstairs, the lobby bar, located at the bottom of the main staircase on the cellar-floor, is primed for kicking back with ample seating, a large fireplace and a chevron wood floor. Clearly, the hotel has saved the best for last. Opening in the winter are its ornate 3,500 square foot ballroom, flanked by steel arched windows and topped with bright red chandeliers, a garden, cafe and 40ft pool covering the expanse of its roof, plus the Watertower Bar, located some 136ft above ground.